Maninjau Lake is a volcanic lake located at an altitude of 461.50 meters above sea level. Maninjau Lake is a caldera from a large volcanic eruption which scattered approximately 220-250 km3 of pyroclastic material. The caldera was formed due to the composite composite volcanic eruption which developed in the tectonic zone of the Great Sumatran Sesar system called Gunung Sitinjau (according to local legend), this can be seen from the shape of the hill around the lake that resembles a wall. 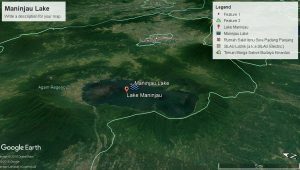 The Maninjau Caldera (34.5 km x 12 km) is occupied by a lake measuring 8 km x 16.5 km (132 km2). The Maninjau caldera wall has 459 m from the surface of the lake which has a depth of 157 m (Verbeek, 1883 in Pribadi, A. et al., 2007).